This one is similar to the previous, but it refers to your own writing. Find something that you wrote long time ago, when you were in a different mood, influenced by other circumstances and give your writing a make-over. Use your own writing as an inspiration for your new poem, dress it in new words, develop stanzas out of sentences and see where it takes you. What’s the color of pain? Is it yellow? For long time I thought it was yellow! wanting to become dark red, like squished cherry tomato, but no..it stays yellow! Or like the pricking lemon juice in your mouth and your tongue just absorbs icy breath. Or is it blue? Like the mirror of my body in the near puddle before I carelessly stumble in it? I would like it to be…like to be..green! Why green? Because it reminds of grass blades in my hair when we played in the woods last summer. of meaningless things, searching for its color, hoping to find rainbow you took away. Try to find a poem that you dislike, that you feel negative about and simply wreck it! That’s right: tear it apart! I don’t mean tearing the physical paper, but omit, reduce, erase, everything from the poem you don’t like and use it as the basis for writing a new one – in a way that feels and sounds right to you. This little, simple exercise can be really helpful later in your own writing. govern by feelings, never left for redeem. to Love Divine – as such. *adapted from Robert William Service poem ‘A Grain of Sand’. your old books, magazines or even shopping receipts and try to create new poem. 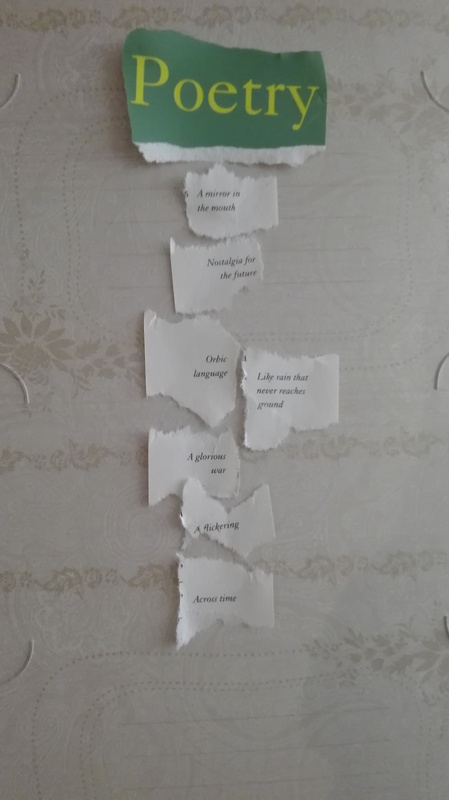 It can be similar to collage, but this time try to focus specifically on words and create your poem out of them. Play with words. Try different arrangements. For your exercise, you can call to mind an issue you have and pick one word of your own interest (it might be connected to a topic you are writing on, project you are working on or any other word that ‘bugs’ you somehow).Write in flow, without too much thinking – just try to follow this one simple rule; don’t pay attention to the logic or the meaning behind your verses; use simple facts about the situation, what you think, what others might think, what you could try or what you already did, what could be holding you back and other thoughts related to the issue. seeing with new eyes in search for forgotten happiness. wonder yet to be discovered in unrevealed land. You pick one word – it can be a word related to your current project you are working on or just some random word you find interesting, attractive or annoying. The purpose of the exercise is in your own words to write down general definition, widely accepted meaning of the word. as water rustles in the sink. Soft rubbing of a tea towel prevents water dripping. and hurry of a zipper. Sudden kiss on my ear like soft touch of a Tinker Bell. That’s the sound of you. Poetry prompt: Dare to compare! Everyone once in a while faces a challenging situation to solve some problem, find an answer to a question; brainstorm an innovative idea. And that got me thinking: what if we challenge ourselves even more? What would happen with our creative flow? Now, I’m not thinking about putting pressure on ourselves, yet we all know we can ‘move’ ourselves towards productive creativity through certain exercises, but creativity is still kind of unpredictable. What I mean by challenge, I mean challenging us by comparing the problem to something else. In poetry is very well known technique called similes. Its purpose is to compare two things, so examples of simile poems include any poem that makes comparisons using the words “like” or “as.” Two things compared don’t have to be alike (in poetry usually they are not), and they create different images in our mind, making correlations and connections that doesn’t actually exist. So for this exercise your goal is to use at least one simile in your poem. and I sharpen my clutches. upon me, always one mile ahead. sour milk from a plastic tin. Take your problem or writing idea and try to look at it from the “What would happen if…. ?” point of view. It’s a great way for creativity “spikes” that we all need when we feel stuck and lack inspiration. It’s also a great starter for your writing of a poem, story and will initiate many new creative thoughts to come forth. Your dreamy face floats on my pillow. What if I am your morning shower? to get forever lost in you. What if I am the button on your shirt? in the rhythm of your loud, silly laugh. What if I am your evening glass of wine? stay forever locked in this moment? This might sound strange at first but when you think about it- it might be true. Often we try to find the solutions to new problems by exploring already familiar models and build our new denouement on old foundations. Furthermore, when we have too many options or resources, we try to incorporate everything and unnecessarily over-complicate solution we are seeking. When we put restrictions on what we can use and what path we should follow, it can actually boost our creative thinking. Here I suggest you improvise a bit with your solution, tackle it from different perspective and simplify your approach. It can be that final “click” you need in your mind to move thinking in right direction. For this prompt, challenge yourself to write a story consisting of only 140 characters, using key words that are crucial for your project, idea or writing. Than you can continue your writing from there in the same fashion, you can tweet about it, play with it and see how it goes. The important thing is to train our mind to work at defined conditions and limited resources. In the paper “Connections From Kafka: Exposure to Meaning Threats Improves Implicit Learning of an Artificial Grammar” authors argue that experiencing (reading, hearing or seeing) something absurd like surreal art or literature can increase pattern recognition of association unrelated to the original meaning threat. In other words, mind always tries to justify, explain what it experiences and “nonsense” art forces mind in faster mode of thinking to recognize what body senses. So for today’s challenge give your attention to something abstract, surreal. You can visit an art exhibition, read an abstract poem or story and let your mind drift, loosen up from everything you were trying to accomplish. Let your mind “recharge” this way. Two-faced, stringy dragon is sitting on my lap. with sharp tail and closed eyes. tongue will burn as expected? with my small fingers still smiling doll. facetiously rolling on the carpet. f you liked this post, please share. And, If you you are interested in getting more inspiration for your creativity, writing and personal growth, sign up for our free monthly newsletter. You’ll get a free e-book with 31 daily prompts to inspire your writing. For additional tips, follow us on twitter and connect with us on facebook. Write a poem, where the first letter of the verse in the poem spells out a word you choose, subject, and message. You can go even further: write a poem where each starting letter of the line is a consecutive letter of the alphabet, from A to Z. In poetry it is called acrostic technique and poets frequently use it while experimenting with their own writing. You, me and all there is. How am I to discern these words to you? Evaporate and let the words mitigate?